I've been scouring the secondhand bookshops and dealers again recently, and have stumbled across some more intriguing out-of-print and hard-to-find Kiwi novels that seem to perhaps fall within the crime, mystery, or thriller fiction categories. 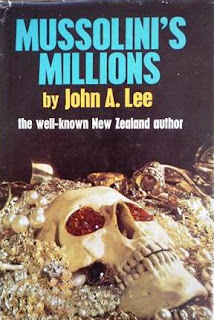 A book I thought I'd highlight today was written by someone who was quite a well-known New Zealander in the early-mid 20th century, for activities away from the page as well: MUSSOLINI'S MILLIONS by John A. Lee. Lee (1891–1982) seems like he was an interesting character who lived a long and very full life - he was awarded the DCM for gallantry in the First World War, joined the Labour Party on his return, was a Member of Parliment from 1922-1928 and 1931-1943, and from 1936 to 1939 he was Under-Secretary to the Minister of Finance and responsible for the introduction of state housing in New Zealand. While an MP in the 1930s he became famous as a novelist and writer on socialism, and then was expelled from the Labour Party for attacking the Prime Minister in a pamphlet (as an aside, in one of those funny coincidences of history, we've just had another Labour Party MP here in New Zealand expelled from the party for attacking the leader in word form). He went onto become a well-known left-wing socialist, founding another political party, and disseminating his views through John A. Lee's Weekly in the 1940s, and then from the 1950s he was a successful writer and bookseller in Auckland. As the Oxford Companion to New Zealand Literature states, "although he miscalculated politically in 1940, he never lost the legendary status he had achieved by that time, a status owed in large part to his writings and gift of oratory". 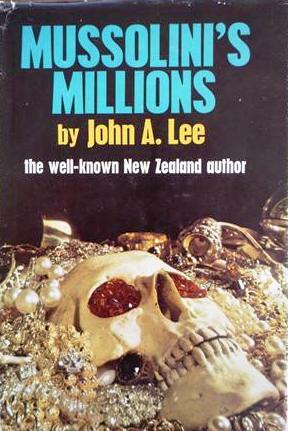 Lee wrote several non-fiction political books, including one that had an introduction by British Labour Party leader Clem Atlee, as well as 'autobiographical fictions' and "potboilers he wrote originally as serials to boost the circulation of his Weekly" - the latter included MUSSOLINI'S MILLIONS, which was published in novel form in 1970. In MUSSOLINI'S MILLIONS, "James Burns returned from incarceration in a Vietnamese prisoner-of-war camp more injured in mind than body. He went to recuperate at the New Zealand sheep ranch of Kevin McArthur and his lovely daughter Jean. It was there he stumbled on two kinds of treasure - the sinister and mysterious hoard with which Mussolini had intended fleeing his defeated country; and the love and affection he had not known he craved. Isolated and immobilised on a lonely New Zealand sheep farm, Jimmy Burns and Jean McArthur found that their discovering of a fantastic treasure placed them in deadly danger. A few desperate men guarded the secret of Mussolini's millions. It was a secret they were determined would never be shared." I'm looking forward to seeing how Lee's famous skills of writing and oratory translate into this mid 20th-century 'potboiler'. You can read more about John A. Lee at the New Zealand Book Council website here, New Zealand History Online here, the Te Ara Encyclopaedia of New Zealand here, and Wikipedia here. That cover looks very familiar. I think I may have read that one (years ago).